AppleWorks on a CRT VGA Monitor. 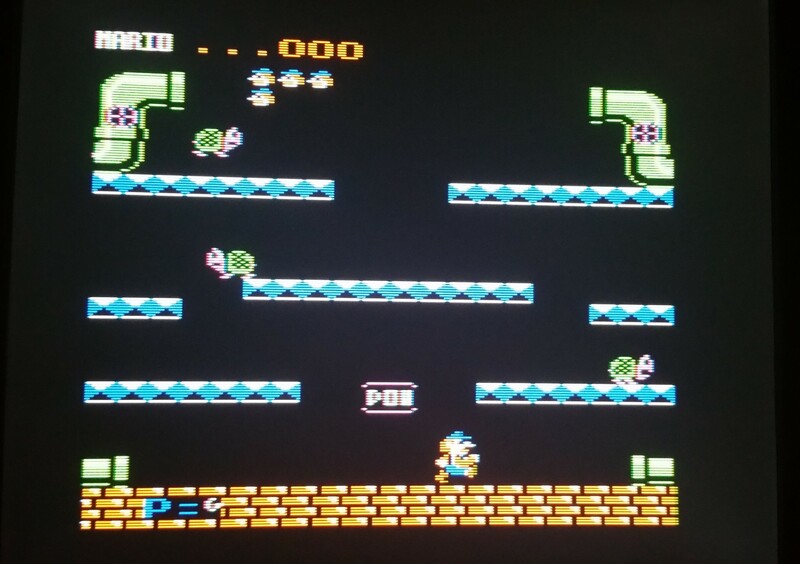 Don't forget, photos of CRT displays look much worse than real life. The perfect monitor was hard to come by for your brand-new Apple IIc in 1984: it just wasn’t possible to combine sharp 80-column text, vibrant colors, and low cost in one monitor. Fast forward to 2016, where combining these attributes is possible thanks to A2Heaven’s Apple IIc VGA adapter, which also allows some extra display perks Woz would never have dreamed of back then, like flat-panel LCD technology, and instantly switchable video modes. If you’re looking to upgrade from a green-screen, or replace a broken or missing monochrome Monitor IIc with something easier to obtain today, then you need the Apple IIc VGA. The Apple IIc VGA adapter consists of a 2.5”x2.5”x1” plastic box, with an HD15 VGA connector on one side that you plug a VGA monitor into, and with a DB15 connector on the other side that you connect to the Apple IIc Video Expansion Port on the back of your IIc via the included short ribbon cable. While this sounds like a lot to connect to a IIc in theory, in practice, the hardware is out of sight behind the computer, and the box and ribbon connector serves as a good strain-relief solution for typically thick, heavy, and inflexible VGA cables. A competing product, Nishida Radio’s occasionally available Apple IIc VGA Adapter, is a bare circuit board that lies almost flush to the back of the IIc (good! ), but forces an awkward VGA cable connection that applies a lot of stress to the IIc Video Expansion Port jack and the circuit board (bad!). I think this is a better arrangement overall, even if it is less compact and makes your IIc slightly less transportable. The plastic box also contains an RCA connector next to the VGA port, and a pushbutton next to the ribbon cable connector. The RCA connector can either output composite video (which seems pointless, since the IIc already outputs composite video via its own RCA jack), or audio (which also seems pointless – there’s a headphone jack on every IIc, but admittedly, not on the IIc+). The pointlessness of this jack almost makes the method you change its operating mode forgivable: you must unscrew and open the plastic box and move a jumper block between different pins. Also, there’s no documentation explaining the process. 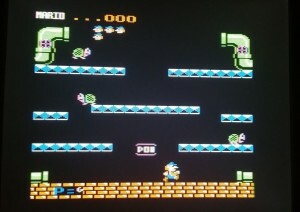 “Normal” Color Mode, with no scanlines. Pressing the button cycles the adapter through the video modes which I have named: Full Color RGB, Full Color Composite, Colors Rendered in Shades of Green, True Monochrome Green (with dithering), and True Monochrome White. Another 5 button presses runs these same display modes through a “Scanline Filter,” which makes you modern VGA monitor look more like a vintage display complete with its course horizontal scanlines. 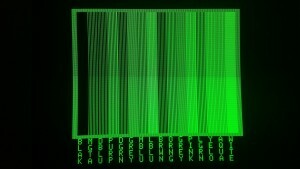 By using these modes, you can ensure what you see on your modern screen faithfully reproduces what a programs’ author intended when it was written and tested decades ago, or even improve on what was originally written, all while maintaining razor-sharp 80-column text in either green or white (a new version of the adapter also supports amber.) With a modern LCD or CRT-based VGA display, AppleWorks, and indeed, every Apple II application I threw at it, has never looked so good, especially on a large monitor. If you read that last sentence, you basically know what you need to: the Apple IIc VGA adapter generates a bright, colorful, and solid image that is probably better than you have ever seen come from an Apple II. I’ve heard some users say that it may even be “too good,” appearing indistinguishable from what emulators generate in Windows and MacOS, but not only do I think that’s silly, but the Scanline modes recreate the appearance of 30-year old monitors very well if you simply must show your children or Millennial co-workers what monitors really looked like back in the day. 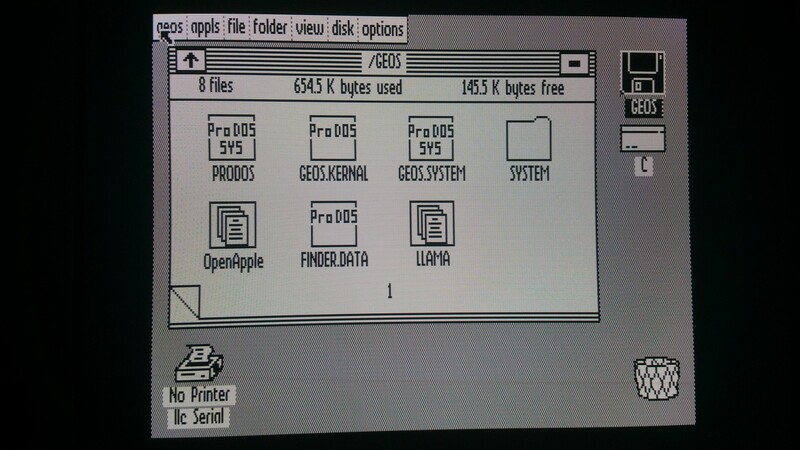 In “White Monochrome” mode, your Double High Resolution GUI programs are practically Mac-like. This is the GEOS disk made by a recent Open Apple podcast. 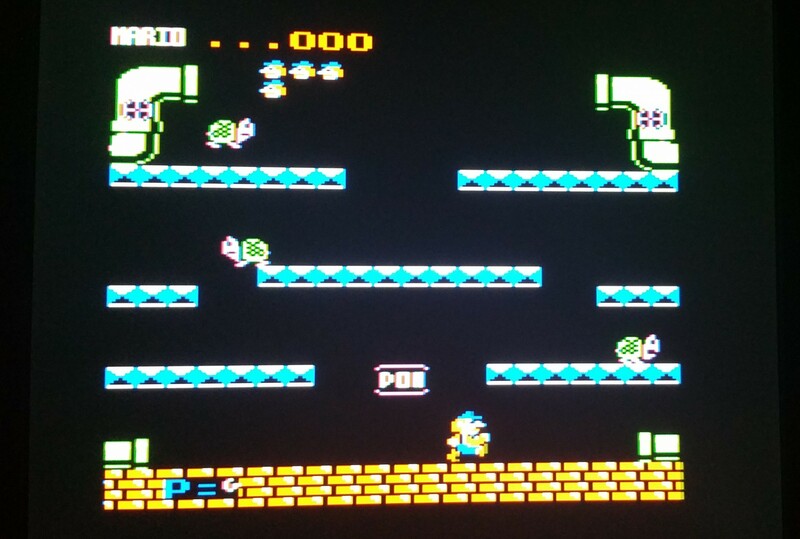 The adapter outputs 640×480 at 60HZ, which counter-intuitively looked best on CRT VGA monitors in my testing. Most LCD monitors have a “native resolution” significantly higher than 640×480, so these monitors must internally “scale up” the image to fit their huge matrix of tiny pixels, and this can introduce a teeny amount of blurriness. Imagine a 1-pixel-wide white vertical line on the Apple Hi-Res screen: an LCD monitor upscaling it might draw it with two columns of white LCD pixels and then a third column of dark gray LCD pixels, which might be mathematically accurate, but it can soften the sharpness of that line. 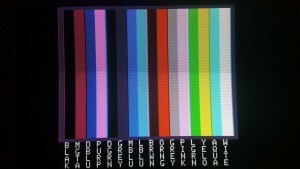 Different LCD displays do different calculations and generate different levels of “softness,” but CRTs monitors are really analog devices that don’t need to calculate pixels – their electron guns just “shoot” lines on the screen with utter sharpness. Don’t get me wrong, every LCD monitor I tried looked better than any 30-year old RGB or composite monitor, but CRT VGA monitors were even better. Viewing AppleWorks on my 19-inch, Sony Trinitron-tubed, flat-faced CRT display from 1999 was almost a religious experience! 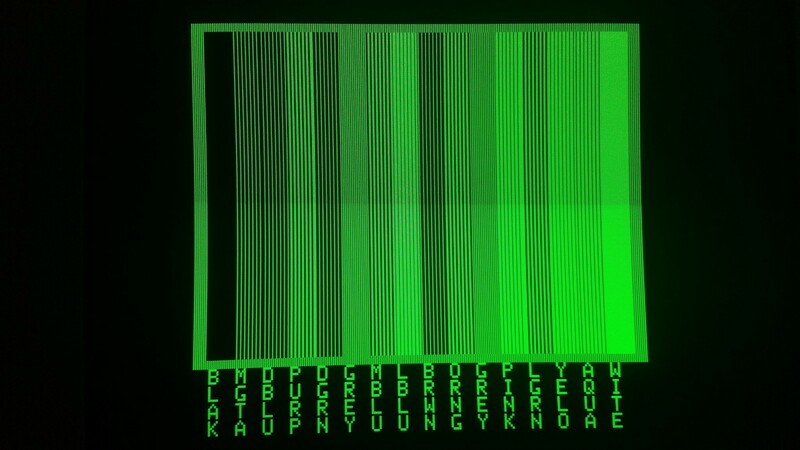 This is what most RGB cards and monitors would display back in the day because it selected the “wrong” video mode. 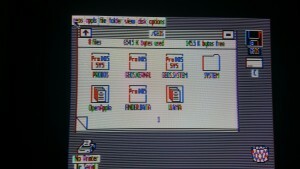 If you really want fringing colors, the Apple IIc VGA adapter will let you. Older LCD monitors might work better than newer ones here, and not just because they are probably in the same 4:3 aspect ratio of a native Apple II display. When LCD’s first came out, manufacturers understood that their customers could still be using a lot of 640×480 VGA output, and their internal firmware and circuitry was highly optimized to render this size image very well despite the panel’s native resolution being larger. The designers of modern 24” 16:9 Retina Displays don’t think any of their customers would display anything in 640×480, so their firmware isn’t as good at upscaling. Also, your modern 16:9 display is going to stretch the Apple II image horizontally, so make sure your modern LCD has a control panel option to shrink it back, lest your Hi-Res circles and squares become ovals and rectangles. 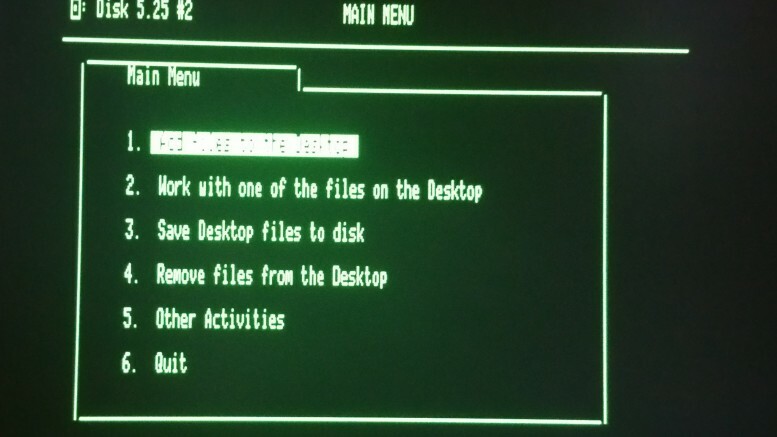 The only display imperfection I observed was a slight “softness” of INVERSE 80-column text, such as what you’d see on the AppleWorks Main Menu when highlighting a menu option. The effect is greater on LCD displays, and it has been attributed to contrast-control. A2Heaven has mentioned on social media that future editions of his adapter may provide an option to counter this effect. I don’t consider this “softness” to be a significant issue, and it doesn’t affect usability in any way. A2Heaven is run by Пламен Вайсилов (which translates, more or less, into “Plamen” for English speakers) in Bulgaria, which is where the Apple IIc VGA adapter is made via automated manufacturing techniques. As such, it wouldn’t be unreasonable for US-based customers to be concerned about customer support and shipping issues. So far, those concerns are unfounded. Before OTNTM was announced, so when I was just a normal customer, I ordered up the Apple IIc VGA adapter for a reasonable $85 and found that the shipping cost was free (or baked into the purchase price; your call). Shipping to the US took just over 4 weeks, which was slightly longer than others have experienced, but a) it was leading into the Holiday season, and b) most of the time was spent with the item just sitting in customs. Also, the USPS Tracking Number sent with the order didn’t actually show anything until the day after the adapter showed up on my doorstep. None of these issues is Plamen’s fault. When my unit arrived, it was faulty – it displayed a crazy interference pattern on one CRT monitor, and absolutely nothing on two others. An email to Plamen was promptly replied to with an apology, an immediate offer to refund my money, an offer to send me a new unit at no cost, and an offer to help troubleshoot the item with me if I was so inclined. Since I’m a restorer of old arcade games and not without some electronics skills, we exchanged emails to troubleshoot, where it was discovered a tiny capacitor was soldered in where it was not needed (I guess the hardware design had evolved and this accidental “appendix” was left over on this unit by accident.) When I desoldered it, the adapter worked on all my monitors perfectly. I choose to consider this story a positive one, showing A2Heaven to be a responsive and honest company run by a knowledgeable person who is willing to troubleshoot when asked, and do the right thing by its customers even when it is not asked. I’ve since ordered and received another product from A2Heaven that worked perfectly right from the box, and I expect to order more products again. In short, there’s nothing to be concerned about here. The Apple IIc VGA adapter is not for everyone. People without eyes, for example, won’t benefit from it. Those who own their own television repair business employing a technician who specializes in CRT repair and maintenance probably won’t see the point. Hoarders possessing many vintage monitors of different types (green screen, RGB, color composite) might say “meh.” And of course, anyone lacking $85 will find it out of reach. But for any Apple IIc owner not in these categories, the A2Heaven’s Apple IIc VGA adapter is arguably the most worthwhile new hardware made in the last 5 years, and you should get one. The IIc VGA adapter has something for everyone. AppleWorks users can view 80-column text sharper than a green-screen, and with a choice of colors to boot! 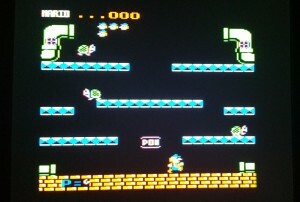 Gamers can play games in any color mode, or correctly dither colors to monochrome. Desktop publishers and GUI users can see the sharpest pull-down menus ever rendered in Double Hi Res screens, with no color fringing. And if you think the image looks “too good,” you can choose a Scan Line mode that makes any modern monitor look like a vintage display. If that wasn’t enough, the kicker is that you can do all this on a single, easily obtainable VGA monitor usable by your other computers instead of maintaining a collection of different monitors that you can’t use elsewhere. Choose a CRT for the best image you’ve ever imagined, or an LCD to save some power and space while still looking better than anything Apple ever made on its own. 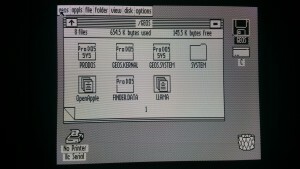 The Highs: The best images you’ve ever seen from an Apple IIc. The Lows: Adds a box to the back of your “compact” Apple II. The Bottom Line: You’ll kick yourself for not getting one.